Home → Mystery → Malaysian Flight 370 or Whales? Malaysian Flight 370 is a true mystery. How does a 777 airplane with 239 people on board vanish? Since March 17, 2014, almost ten days after MH370 disappeared, I’ve been helping solve the mystery. On this day, DigitalGlobe launched a crowdsourcing campaign to help find the missing airliner. My participation has been enlightening. Besides highlighting my neurotic idiosyncrasy for hunting for things (Need me to find a needle in a haystack? Give me a call! ), it also emphasized the power of the mind. Although everyone hopes the airliner and its passengers might be found on land and alive, those participating in the campaign know what they are really looking for – parts of a plane, metal objects, life jackets, suitcases. In scanning over 10,000 map areas, I identified 269 items that I believed could be remnants of Flight 370. But what are those items really? 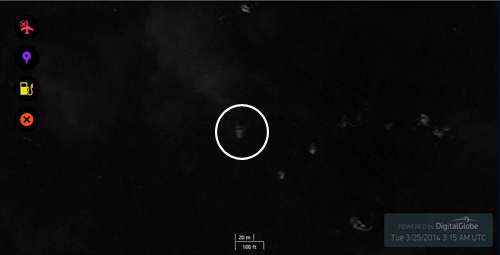 The image above left is from www.tomnod.com, the campaign site where individuals can sign up to help find the missing Malaysian 777. 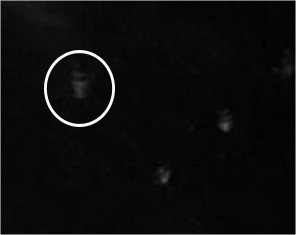 The area circled is what I clearly thought was some type of engine or piece of an airplane. It looked reflective to me. Using the reference provided on the site to gauge size, the object is approximately 20 – 25 feet wide and 50-60 feet long. When I zoomed in, it had the appearance of being cylindrical in shape, wider at one point and a bit narrower at the other end. The image to the right is a “magnified” view. When asking fellow searchers what the image could be, someone said they had been told that this is what whales look like from a satellite. Who knew? Since the search for the missing airliner has begun to fade from the 24 hour news stations, it is now more important than ever for people to give what time they can to help find this airplane. The friends and families of all those aboard the flight need to know the fate of their loved ones. The mystery needs to be solved and the only way it can possibly happen is to find the missing airliner.